South end of the large area where my son slept. North end of the lafe area where i have the long arm. Thinking that it would only take me 2 weeks to get this project finished and id be all one by April 8th. Boy, was I wrong it took me almost 2 months… Had to move stuff into the furnace room from my dungeon, then move my son out of the large area where his bed was.. then the real work began.. I covered the stairs with idea runner carpet, and put accordion door on the shelves that store Rubbermaid totes. as you come down the stairs a shelf wall was build to hide the sewer pipe this is the east wall. South east corner with cutting table and ironing station at the end of my sewing desk. The design wall is made from gridded flannel. view taken from behind my sewing station. All that I have left to do is to install the windows on the west walls and install drop ceiling. I feel real creative in my new space.. it has lots of storage and is bright compared to the dungeon. Hope you enjoyed a tour of my new studio. Previous Hayden… my 1st collage. 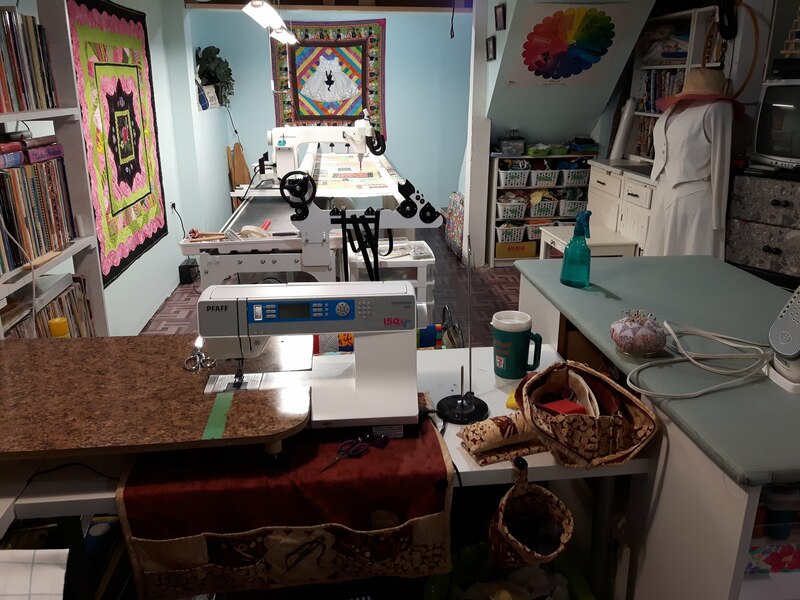 I just love your space – here in the UK most houses do not have a basement, so my sewing space is up in the loft and things are a bit tight!!! I would love to have a Longarm machine but have nowhere to put one. thanks meg… do you have the option to do a studio in your garage? or a outside shed?